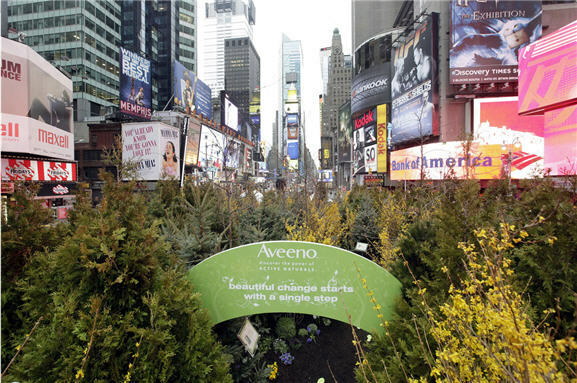 Aveeno Skincare created a pop-up forest inNew York City's Times Square. Visitors who trave;ed through the Aveeno Active Naturals Forest in Times Square experienced how nature makes the planet more beautiful and received seed cards to plant their own trees and samples of the latest Aveeno Active Naturals Products. Visitors to Aveeno's Facebook page can also make pledges to earn points that will result in rewards, such as Aveeno product samples, tree seedlings and sustainable tote bags. Aveeno is also donating 500 trees to MillionTreesNYC, a public-private partnership between New York Restoration Project (NYRP) and the City of New York.